England fans had endured a 12-year wait to see England appear at the World Cup finals. Those who had loyally followed them during the lean years deserved something to get excited about and they got it 27 seconds into the first match against a highly-rated French team in Bilbao. A long throw was headed on by Terry Butcher and an unmarked Bryan Robson was on hand to score. It was a training ground move worked to perfection, England catching the French cold with one of the fastest goals in World Cup history. 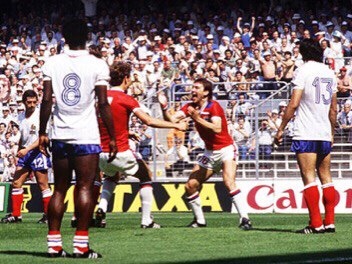 Robson was rewarded with a solid gold watch for his timely strike and he added another goal later in a 3-1 win, as England gave a performance they struggled to replicate before being eliminated in the second phase. But for Robson it was a special moment, coming just a day before his wife gave birth to their second daughter, Charlotte. 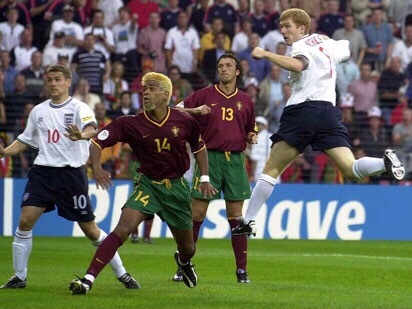 He really had scored the daddy of all early England tournament goals. In a situation not too dissimilar to today, England went into Euro 2000 with their attack looking stronger than their defence. This would duly prove the case. England’s opening match against Portugal in Eindhoven was only in the third minute when David Beckham swung over an excellent cross and his Manchester United colleague Paul Scholes was on hand to head in. Steve McManaman soon put Kevin Keegan’s side 2-0 up and the nation began dreaming of the team finally winning major silverware. But not for long. The Portuguese fought back to win 3-2 and England failed to get out of the group stage. There was an extraordinary level of hype surrounding England going into the World Cup 10 years ago, with thousands of fans travelling to Germany and a widespread belief they could finally deliver. In the third minute of England’s opening match in the heat of Frankfurt that expectation grew even more. David Beckham’s free-kick went in via Paraguayan defender Carlos Gamarra. It seemed the springboard to a comfortable win to let the rest of the world realise what a threat England posed. But it never came, the side looking increasingly less assured as the game progressed and stuttering to a 1-0 win. And that set the trend for a World Cup in which England seldom sparkled, before losing on penalties to Portugal in the quarter-finals. Four years on and a similar story. There wasn’t quite the same hype or expectation as in 2006, but there remained a belief Fabio Capello’s side could do well in South Africa. ‘EASY’ The Sun had proclaimed when the draw placed England in a group with Algeria, Slovenia and the USA. Four minutes into the opening match against the Americans and it seemed they might be right, Emile Heskey feeding Steven Gerrard to score. 1-0 to England and also to anyone who hadn’t bothered forking out for a HD television, as ITV HD viewers missed the goal due to an advert inexplicably being broadcast at the time it was scored. That might not have seemed quite so bad had England go on to win comfortably, but it was the only highlight of the night as they drew 1-1 and never got going in the tournament – eventually being crushed by Germany in the second round. 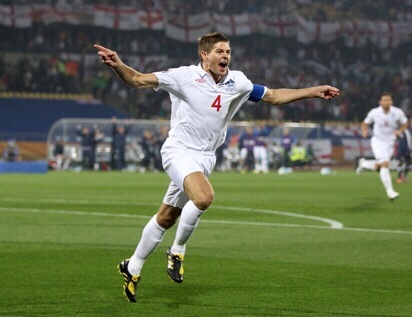 Gerrard’s goal was one of just three they managed in four matches. During Euro ’88, England had been beaten in their opening match by the Republic of Ireland courtesy of an early goal by Ray Houghton. Now they were meeting again in the corresponding game of Italia ’90 and it was England who made the breakthrough. Despite feeling unwell, Gary Lineker managed to bundle the ball home and England were ahead after eight minutes. It was a scrappy goal in keeping with a poor game, but neither Lineker nor the English nation were complaining. But unfortunately the match would follow a familiar pattern after England strike early, with Kevin Sheedy drawing the Irish level. For Lineker, his night would be remembered more for an incident in the second half which has provided Twitter trolls with endless fun. There was plenty of criticism of Bobby Robson’s side afterwards, having shown little evidence they could go on to look a potential winner – but they would of course get to the semi-finals, only losing on penalties to West Germany. It had been a long wait for the 1996 European Championship to start on home soil, while for Alan Shearer there had been a seemingly endless struggle to end his England goal drought. But midway through the first half of the tournament opener he duly netted when it mattered, making the most of an excellent ball from Paul Ince to score. England were on their way, although the usual story would follow – failing to build on their lead and being pegged back as they drew 1-1. It was a frustrating day, but for Shearer it was a goal that would set him on the way to finishing as the tournament’s top scorer. Against Germany in the semi-final he would strike an early goal, netting in the third minute. Some honourable mentions here for Sol Campbell v Sweden (2002 World Cup, 24 mins); Ray Wilkins v Belgium (Euro ’80, 26 mins); Stan Mortensen v Chile (1950 World Cup, 27 mins) and Joleon Lescott v France (Euro 2012, 30 mins). All put England ahead within half an hour of their first match at a major tournament. As can be seen England have a habit of striking early when they play their opening match at a championship. Will it happen again against Russia?